AT&T and T-Mobile have stopped exchanges of Samsung Galaxy Note7 smartphones that were aimed to solve an issue of overheating batteries in the previous version, following reports that the new phones have also been involved in incidents of overheating and even explosions. Samsung has said it is investigating the issue and will share findings as soon as possible. “Based on recent reports, we’re no longer exchanging new Note7s at this time, pending further investigation of these reported incidents,” AT&T spokesman Fletcher Cook wrote in an emailed statement Sunday. “We still encourage customers with a recalled Note7 to visit an AT&T location to exchange that device for another Samsung smartphone or other smartphone of their choice,” he added. T-Mobile also said Sunday it is temporarily suspending all sales of the new Note7 and exchanges for replacement Note7 devices. “Customers can still bring their recalled Note7 or the new replacement Note7, along with accessories they purchased from T-Mobile, to a T-Mobile store for a full refund and choose from any device in T-Mobile’s inventory,” the mobile operator said in a statement on Sunday. Under an official program announced last month by the U.S. Consumer Product Safety Commission, about 1 million Note7 smartphones sold in the U.S. by Samsung before Sept. 15 were recalled following concerns about faulty lithium-ion batteries in the devices, which could overheat and even explode. As part of the agreement with CPSC, customers could return the phones to Samsung for a refund, or exchange it for a new Note7 device, in which the battery issues had been resolved. 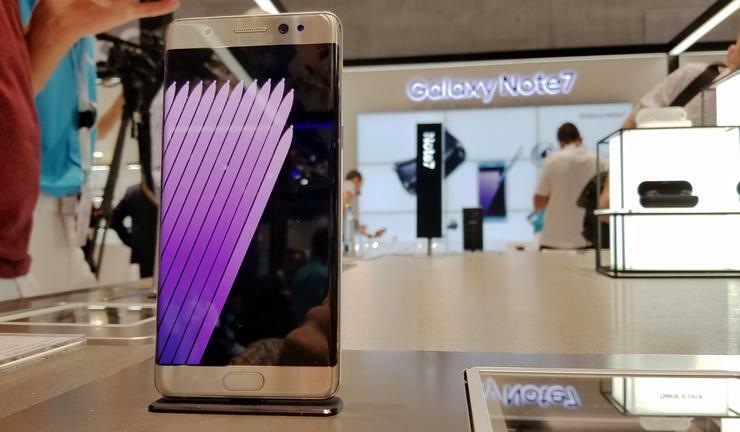 The company also announced an exchange of the Note7 with Samsung’s Galaxy S7 or Galaxy S7 edge devices, and replacement of any Note7 specific accessories, with a refund of the price difference between devices. The number of reports of replacement Note7 devices that have overheated or exploded has gone up to seven, and included a Note7 that caught fire on a Southwest Airlines flight, Ars Technica reported Sunday. On Friday, Samsung said it "understands the concern" its carriers and consumers must be feeling after recent reports raised questions about its newly released replacement Note7 devices. It said it would work with the CPSC to address the situation if a safety issue is found.